Wi-Fi internet and free Sky TV channels are available at this 3-star hotel. 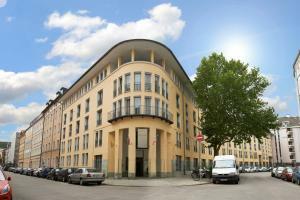 It is in Munich's Isarvorstadt district, a 3-minute walk from Fraunhoferstraße Underground Station. All rooms at the GHOTEL hotel & living München-Zentrum include a desk and safety deposit box. A kitchenette is provided on request. Cutlery is available at the reception. All offer free Wi-Fi. Each morning, the staff at the GHOTEL München-Zentrum prepare a breakfast buffet. Drinks can also be bought at the hotel during the day. Restaurants, cafés and bars are nearby. The GHOTEL is a 10-minute walk from Viktualienmarkt square and a 15-minute walk from Marienplatz square. There is a direct link to the Messe München exhibition centre from Fraunhoferstraße underground station.